Official application portals like Apple's App Store and Palm's App Catalog are the big box retailers of the mobile space: plenty of choices, but to get the really good stuff you have to go elsewhere. 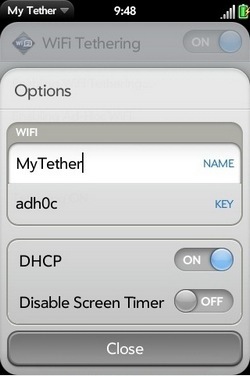 Case in point: My Tether, an app that, naturally, allows tethering through a Pre, and does so quite comprehensively. Palm's savior can be directly attached through USB, but Bluetooth and WiFi are also available, thus delivering the connectivity trifecta. It's a lot easier to enable than the last option we found, and though the fully-automatic, self-installing version costs $10, there's a free one if you're feeling cheap (and know your way around a shell prompt). We're still waiting to see whether Palm or Sprint will put an end to these 3G hijinks, since the pair are obviously not in favor of them, but right now this particular carrier needs every selling point it can get -- even unofficial ones like this. My Tether turns mild-mannered Palm Pres into wild and crazy hotspots originally appeared on Engadget Mobile on Thu, 06 Aug 2009 09:26:00 EST. Please see our terms for use of feeds.